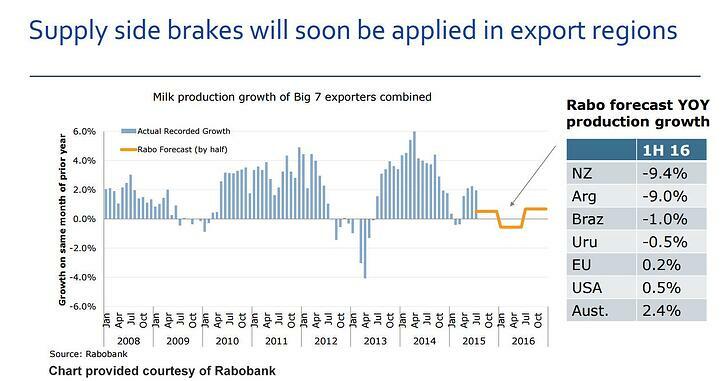 USDEC President, Rabobank strategist, see better times ahead as global markets rebalance and demand increases. Those were the questions posed by Tom Suber, president of the U.S. Dairy Export Council (USDEC), at last week’s USDEC Board of Director’s and Membership Meeting in Chicago. They are, in fact, questions many commentators have been asking these days, given the international dairy sector’s prolonged market downturn, slow recovery and the U.S. dairy export slump. Suber’s answer: The fundamentals for long-term U.S. dairy export growth remain in place, but changes in the marketplace require successful U.S. suppliers to intensify their efforts in the years ahead. “Specifically, what we’ve seen is the situation forecast six years ago in the landmark Globalization Report authored by Bain & Co. for the Innovation Center for U.S. Dairy: a more intensely competitive dairy environment,” said Suber. That report clearly stated that the United States had a finite window of opportunity to better equip itself to compete globally before the squeeze of surging demand against constrained supply brought forth new milk. The study’s authors missed only the source of that milk, predicting the development of low-cost producers like Belarus and Brazil rather than the European Union (EU), but the milk nonetheless has flowed and competition has tightened. Board meeting speaker Tim Hunt, global dairy strategist in Rabobank’s Food and Agribusiness Research Advisory, expressed similar views in his presentation. The world economy is poised to grow 3.5-4 percent annually for the next five years—“much higher than population growth, so incomes will rise,” says Hunt. There is ample room for consumption growth in emerging markets, even if you compare similar cultures. “As incomes rise, we have a fairly good record of bringing those countries up on a consumption basis,” said Hunt. A prolonged period of lower retail prices is going to do enormous good in unlocking consumption growth. “I think we forget how much damage we did to the market through the record pricing of 2013/14,” Hunt said. Emerging markets are still expensive and difficult places to produce milk. They will struggle to keep up with domestic requirements. Facing significant environmental, political and other constraints to production, the EU, New Zealand and other surplus regions cannot meet demand growth on their own. Expect international dairy trade to expand by over 3 percent annually through 2020, Hunt said. That’s about half the growth rate of the past five years or so, but still a healthy gain that would leave the world looking for around another California’s worth of milk between 2014 and 2020. 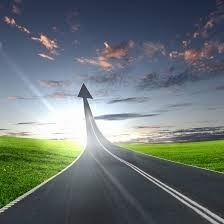 To get there, however, we need to pull out of the current market imbalance. That requires a greater production response to low prices and the ability to work through an estimated 5 million tons (milk equivalent) in excess inventory in key trading regions globally. 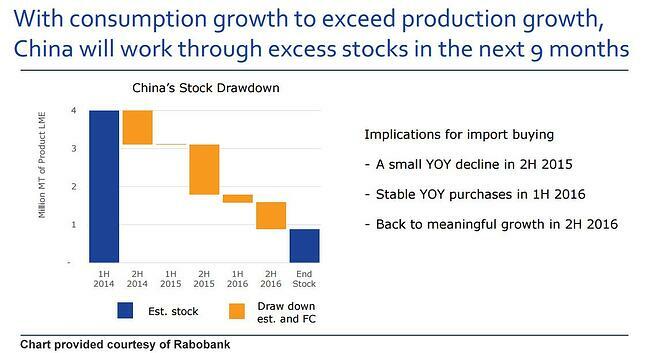 Rabobank expects WMP prices midway between $3,000 and $4,000/ton for next five years or so. That being said, it will not be business as usual for U.S. exporters moving forward. From 2010-2014, China practically accounted for all global dairy trade growth. In the future, it will account for about 20 percent, with greater representation from Southeast Asia, the Middle East, Africa and parts of South America. “Trade growth will be more broadly driven. That will require U.S. suppliers to implement broader marketing strategies,” said Hunt. Among those assets are mid-range cost of production, a geographically diverse milk supply with less seasonality than many competitors, ever-better risk management tools, a large internal market for scale and stability, high-productivity herd management, and effective supply chain improvement programs, including efforts on sustainability, traceability, food safety and consumer confidence campaigns.